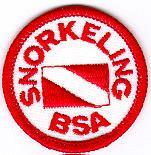 The Snorkeling, BSA Patch is NOT worn on the Uniform. Show how to prevent the mask from fogging and how to equalize pressure in mask, ears, and sinus cavities. With your head underwater, flood the mask, observe the effect on your vision, surface, and drain the water from the mask. With your face in the water, breathe through the snorkel. Then submerge, surface, clear water from the snorkel, and resume free breathing without removing the snorkel from your mouth. Walk with fins as if entering from a beach. Swim at the surface (10 yards) and underwater (three yards) using the flutter kick. Proper techniques for entering and exiting the water with snorkeling equipment from a dock or boat. Demonstrate divers’ signs and signals, both audible and visual, for use at the surface and underwater. Set out a diver down flag and explain its function. In clear, confined water eight to 12 feet deep that has a firm bottom, while swimming with a buddy, use mask, fins, and snorkel to locate and recover an object from the bottom. Float facedown for five minutes while breathing through a snorkel with a minimum of movement. Demonstrate survival floating for five minutes without use of a snorkel. Using fins, show how to tow an exhausted or unconscious buddy to safety. related to snorkel swimming and diving. What is hyperventilation and how is it avoided? What are the symptoms and consequences of hypothermia? Why is CPR training recommended for those participating in swimming and snorkeling activities? Source: BSA Publication No. 430-603.